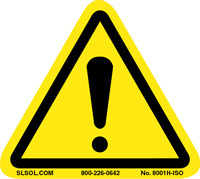 Safety Labels provide a direct and efficient method of displaying your information. Our wide selection of ANSI Caution, Warning, and Danger labels allow you to properly identify and display the level of hazard for each situation. 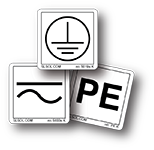 Our large selection of ISO symbol labels can communicate your message on an international level, while our IEC labels are suited for all your electronic and electro-optic needs. In conjunction these labels can convey important information for a variety of hazards including, Arc Flash, Heat or Hot Surfaces, Electric Shock and High Voltages, Heavy Lifting, Mechanical Crushes or Pinch Points, Radiation Safety, Laser Safety, as well as protective gear situations. If your situation requires safety labels not found in our stock selection we can provide you with custom safety labels to fit any of your requirements.